I’ve followed his blog for quite a while now. The dude shares some amazing leadership insights there regularly and it has been fun to see their churches journey from a distance. Oddly enough though, I didn’t have super high expectations for this one. But I was dead wrong! Furtick blew the place up and ended with a standing ovation. He had originally planned to speak out of 1 Samuel as printed in the materials, but changed his mind and spoke from 1 Kings 18…kinda. To be honest, I don’t remember a whole lot from the scripture, but the sharing of his own story and his encouragement to all of us there was pretty awesome. His point, as I mentioned a few posts ago, was talking about moving from the promise to the payoff. Often when there is a promise from God, there is a part that is often not talked about at conferences like these and that is the long, often painful road of the process to get there. Overall, I pretty much didn’t write down any notes from Steven’s talk, but just sat back and was encouraged and challenged. Furtick reminded us that 2 years ago he was in “the nosebleed section up there at Catalyst” himself. He encouraged the youth pastor struggling with 5 kids and the worship pastor who has to do the hymns he doesn’t even like and the pastor pulling teeth to lead his congregation to keep on trucking and to get up and preach like it was the last time ever and to lead to worship like you’ve never led before. Thanks for the reminders Steven. 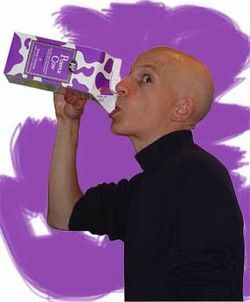 Many of you may know of Seth Godin as a marketing genius and business blogger extraordinaire who wrote some great books, including Purple Cow. Well at Catalyst Conference he spoke on the concept of Tribes, and then gave everyone there a copy of his new book, Tribes. It was such an intriguing talk and the book such an easy read, that I’ve already read it. (I also ended up with an extra, so who knows, there just may be a giveaway here before the week is over if anyone’s interested.) Some notes. Tribes matter…more than word of mouth. Interupting people is broken. Proseletyzing is broken. Now it is all about tribes. A crowd is not a tribe. Positive deviants – find someone who naturally leads, who is challenging the status quo, and give them a platform to lead more. You have to do something people will criticize. If you’re concerned about being safe, you’ve already failed. No one wants to follow a safe leader. find people that are alone. find people who always knew there were people out there like them. put together people who would never otherwise be together. Heretics don’t let the rules and religion stand in the way of their faith. 4v2 – Are you doing something for the tribe or to the tribe? Hands down, the highlight of the conference. I pretty much shared the impact of this with you here. I’ll start by saying, I already had high expectations. Graig is pretty much my favorite pastor out there right now. He is the one whose podcasted messages I watch regularly. There was a “sit together” section of preferred seating right in front of the stage for different groups of people each session. I was sitting in the front row. I’m not into the whole celebrity pastor thing, but let’s just say I found myself thinking several times, “No way! Craig Groeschel is like 20 feet away from me tight now!” Lame. I know. However, I must say it was impacting to be that close and experience the passion this guy was putting out up close. The title of Craigs talk was, “Finding It When You’ve Lost It.” It was based on his new book, IT. The concept: they have campuses that all things considered are on level ground. Same type of venue. Same technology. Same video messages. Similar worship styles. However they would visit one and come away saying, “They have it,” and from another saying, “They’re missing it.” So what is it? Buy the book. Saying “it” is the Holy Spir-it doesn’t work. That’s insulting saying that the Holy Spirit is in one place and not the other when we know that it is in both places. The reality is there is a different manifestation of the Spirit dependent upon the work of God’s people in a given place. The most important ingredient to your church having it is that you have it. If you have lost it, you must do somethin drastic to get it back. Cause if it were a small tweak, you would have done it already. Some of you have eaten your last meal for a while and you need to walk out of here and fast and pray and mourn until God shows up in a powerful way!! You need to ask God to stretch you. But before He can stretch you, He has to heal you. But before He can heal you, He has to ruin you. Who/what will stretch you? Who/what will bring about healing in your life? Now go and get yourself around that person. That honestly doesn’t even begin to unpack all that was in Craig’s message. But at least it gives you a glimpse into where it went.